Welcome to Erin Ridge Veterinary Centre, a family-centered, patient-oriented facility that takes your pet’s health to heart. 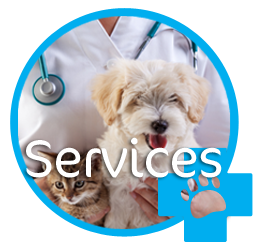 We offer a full range of veterinary services with first-class technology and a warm, confident team in our new St. Albert location. ""As a reptile owner and fellow biologist, I am very pleased to say the Dr. Jackson knows what he is talking about when it comes to our scaly friends. It is nice to see a veterinarian that is confident with exotic animals and knowledgable with diseases. If you have reptile problems, I suggest you go here!"" "I really cannot say enough about how good Dr. Cox has been for us. She is so warm and friendly and it is such a relief for us to have finally found a vet who was able to get our dog’s skin issues under control. We are so excited that Dr. Cox is moving to St. Albert and will be much closer for us!" "We have been here a "few times" (8 month old puppy) Zora and just love both Dr. Cox and Dr. Jackson! They are both so attentive, informative and very very helpful! The staff are amazing and are very friendly and so helpful to get us in on short notice. We can't say enough great things about this clinic so thank you for putting your business in Erin Ridge! " ""Friendly, knowledgeable staff in a nice new building! We loved it!"" "The staff was very warm and friendly. Doctor Allison was very knowledgeable and gentle with my old golden retriever. She seemed to be invested in his well being and genuinely wanted to help us make sure our dog is healthy. The rooms were clean and well kept. The reception area was very spacious which is a plus when you have a big dog like mine. They are easy to get a hold of if there is an emergency, encouraging the use of email or phone calls for follow ups."